THIS PAINTING IS available in a "Four Seasons" set of high-quality giclee* prints. To view the set and purchase click HERE. FINISHED WITH A deep sienna mat, under glass, in a dark brown/black 22"x28" frame and ready to hang. 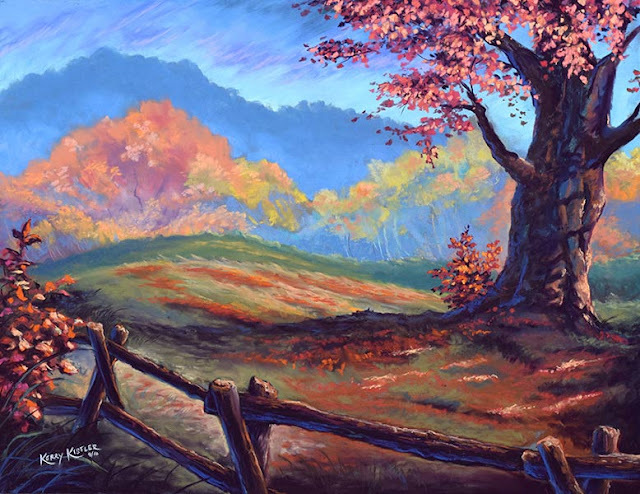 *A NOTE ABOUT OUR PRINTS: Wistful Vista Art offers top-quality giclee prints of our original artwork. In the fine art world, giclee reproductions have to meet strict expectations regarding precision, color matching and longevity standards. Our supplier uses only archival, American-made, ph-neutral paper and canvas. Combined with OEM archival water-based pigmented inks (rated to last over 100 years), these materials will yield the longest-lasting, best-looking giclee prints available to art buyers today.